strings and tennis racquets which are used by several top players such as Rafael Nadal, Kim Clijsters, Andy Roddick, Leander Paes, Fernando González, Igor Andreev, Fabio Fognini, Nicolás Lapentti, Samantha Stosur, Robby Ginepri, Li Na, Dinara Safina, Agnieszka Radwańska, Santiago Giraldo, Carlos Moyà and Francesca Schiavone. The company has made strings since 1875, when Pierre Babolat created the first strings made of natural gut. 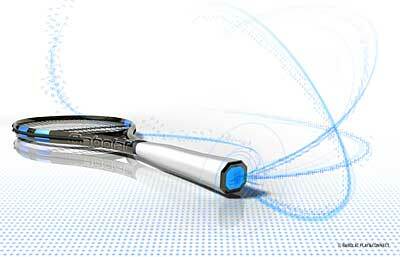 Babolat has recently revealed a new high-tech racket that it thinks can revolutionize training for tennis. The company has called the racket in question the Play and Connect. The racket is packed with sensors and can be used primarily to analyze every aspect of a player’s swing and performance. In order to maintain the right feel that every athlete has for their rackets the company has found a way to pack the racket with sensors and technology but still make it like enough so it feels exactly like a normal albeit expensive tennis racket and is equally light. Before this technology existed, a player’s performance was tracked by recording the way he plays and watching the video again and again to see the minor errors or to see the small flaw in their technique perhaps but with the Play and Connect, users will be able to measure ball speed, force exerted during a swing, vibrations of the strings and the exact location on the racket that made contact with the ball. All of that data can be downloaded on a program and kept to track performances over time and also analyzed to optimize better playing techniques. Fore more information watch video below.